There might not have a been a film this summer with more hype than Ghostbusters (2016). That is, of course, both positive and negative hype. Ever since its inception it felt like the film was hiking an uphill battle against a swarm of middle-aged complaining misogynists, who really didn't seem to have this sort of issue with the RoboCop (2014) reboot. This has unfortunately become really wrapped up in the conversation about Ghosbusters, to the point where not addressing it would seem awkward. Having said that, due to a combination of that section of the Internet being horribly and obviously wrong in addition to the fact that that conversation has been developed to death by just about everyone else, that'll be the last of that. Let's now focus on the merits of Ghosbusters the film. SPOILERS from here until forever. First thing's first to get this out of the way - Ghostbusters is pretty funny, but it really doesn't stand up to Ghostbusters (1984). That's perhaps a really unfair comparison, because there's not really much that can stand up to the original Ghostbusters, not even Ghosbusters II (1989). It's also exactly as funny as SPY (2015), which ought to be expected. For some reason I can never really get into any of Paul Feig's post-Bridesmaids (2011) work, I think mostly because I'm not a chick, which is fine. There are a lot of great moments here, though. The intro in particular starts off with a really nice dose of absurdity and then arguably does a better job at introducing the characters and this world than Ghostbusters (1984) did. From there it somewhat loses its way as it always feels like it's holding back something, preventing the film from becoming truly special. It exists in this awkward limbo between paying homage to the original and striking out on its own. There are lots of callbacks and cameos, all of which are decently weak. I actually appreciated Ernie Hudson's return the most, near the end of the film, but they amazingly featured Bill Murray without cracking a single joke. It was also probably a terrible idea for him to be killed. That whole sequence seemed to dabble in meta-commentary on how the new crew can't stand up to the old crew, but instead of acknowledging this as fact like Jurassic World (2015) did, it ended in new crew arrogance, which seemed like a bad move. Where the movie shines best, though, is the new stuff. It was great to see a variety of new weapons, a twerpy villain acting on his own agency rather than being a pawn, and a series of thrilling all-out brawls with the ghosties. 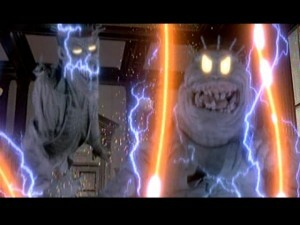 There were also a handful of moments with legit terror, which rise above anything Ghostbusters '84 did. It always seemed like the original was more interested in the occult, old gods, and mystery rather than acknowledging that these were dead folks. Sure you've got the Scoleri brothers, the Titanic, and that dead Librarian, but they all look like this, and seem distanced from how gruesome they are. Ghostbusters '16 ups the creep factor a ton and explicitly deals with death, even if there is still a bit of a gap there as it dabbles in the science of the dead more than any spiritual or religious aspects. On the note of the ghosts themselves, the production design and effects are outstanding. I love the neon glow style that really gives them a distinct feel. New York is artfully crafted, even if the grime of Ghostbusters '84 is missing (to be fair, the city's a whole hell of a lot better than it was in 1984). I am curious, though, how the weapons worked - there never seemed to be an explanation that the proton packs basically lasso the spirits until they can be contained, nor anything about crossing streams. Maybe these aren't rules anymore? This again is where that intersection between the remake's faithfulness vs. originality gets more muddled than it needs to be. 1) Kate McKinnon's Jillian Holtzmann is, as predicted, the obvious stand-out. She almost feels like an amalgam between Egon Spengler and Peter Venkman because she's simultaneously their biggest brain and goofiest personality. It ends up not really being analogous to anything, which was Feig's goal, which I did say I could see her fitting either role. It's the good kind of role that left me wanting quite a bit more out of her; to be pushed even farther into that goofy silly role. There are really witty scenes like this and then quite a bit where you wish she hits those heights again. 2) Chris Hemsworth commits so hard to the moronic role of Kevin, and you've got to think that his surprisingly successful stints as an SNL host have contributed to his uncanny rapport with these ladies. He's the source of a lot of the jokes as almost all three other women prove to be the straight characters to bounce off his extreme goofiness. It's also a great bit of female gaze, which helps push Ghostbusters to also be exactly as feminist as SPY was, in the sense that it's more matter-of-fact, with the guys being really dumb and getting in the way, which is actually pretty accurate to real life. 3) Kristen Wiig as Erin Gilbert is the closest thing we have to a protagonist to latch on to, and she does a serviceable job with some of the heaviest acting lifting. She is definitely the best actor of the group, their Graham Chapman if you will. She's a bit too much Skeleton Twins (2014) and not enough Welcome to Me (2014) if we were to gauge her goofiness scale while still maintaining playing a real person. She gets one desperate Bridesmaids-esque scene where she freaks out on the Mayor of New York (a game, if weirdly giggly Andy Garcia) that she does really well. Like McKinnon, I wish she was pushed to that edge more often instead of being reserved. 4) Leslie Jones as Patty Tolan was somewhat that Winston Zeddemore role, which is all sorts of ridiculous from a racial standpoint, although her inclusion seemed a lot more forced (she just shows up unannounced rather than answering a job posting), and doesn't really work as the audience surrogate that Zeddemore did. When I was calling out roles I thought Jones could have done a lot more, and she really shines when she's alone getting chased by a creepy possessed mannequin. It reminded me of this, which is probably her best SNL sketch outside of Weekend Update. Still, it's so painfully clear that she really can't act at all, which we all knew already. 5) Melissa McCarthy's Abby Yates isn't really awful as much as she's just sort of a nothing character. There's not a lot of personality there at all. Even Egon, who was a block of wood in the first run at this, was comically deadpan and could bounce off the other characters. Aykroyd's Ray Stantz is the closest analogue, but he had enthusiasm matched by an innocent appreciation for his undersung work, which very much matched Aykroyd's unbridled passion in the source material. For an actress who has the range, passion, and fury that McCarthy has, it's a surprisingly dull take on the role. There's not a lot of tension to bounce off besides Wiig, which doesn't really last long. For everyone else it's more of the same. Cecily Strong is so damn funny, but she's hardly in this and doesn't present herself to be a foe to match William Atherton's Peck, in part because there's never any real tension there, just a weird disconnect between wanting the Ghostbusters to continue their good work but officially covering it up. The movie seemed afraid to rip-off its source material directly, which makes for a rough outcome because the original did everything so damn well. Even in the analogous mayor meeting scene you can see Kristen Wiig trying to hold back from saying "Dogs and cats! Living together! Mass hysteria!" Totally a Stay-Puft without being Stay-Puft here. 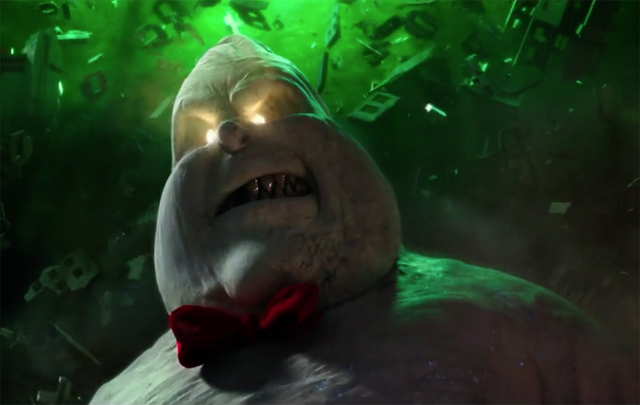 This is ultimately the reason why Ghostbusters '16 seems like such a miff. As I said in that very first post, wouldn't it be nice if we had an all-female original action comedy rather than simply a spin on the train of a previously established IP? Feig has said that there's no way that movie would be greenlit, but if this flick had done gangbusters, we might have gotten something better. Still, at the same time, I think this summer has poked enough holes in the ridiculous Hollywood paradigm that anything made should be previously based on anything, as long as it's something. Good movies are good movies, and interesting movies look interesting because they're interesting, not because we're into whatever they're based on. One final note, because I doubt many people caught this, since it had such dire viewership, but as a big fan of Feig's Other Space I was also pumped to see all five principal actors (the exceptions of course being Joel Hodgson and Trace Beaulieu) show up in some way or another in this. Bess Rous starts us off as the Aldridge Mansion Ghost, who adds some sincere doofiness in her first painting (I actually thought it was Kate McKinnon at first, which would have also been a great dual role). Karan Soni, following up Deadpool (2016) has a major role, as does Neil Casey, who is the principal villain. Milana Vayntrub and Eugene Cordero are blink and you miss them cameos as a girl attacked by rats and the metal band bassist respectively. Conor Leslie is no where to be seen, but it's a weird, awesome thing to see that obscure cast gathered together again. So my ultimate appraisal of Ghostbusters is that it's good, but not great, but only because it tended to parcel what makes it good out in little bits instead of leaning headstrong into everything that could have made it weird and magical and awesome. It invites a lot of comparison to the original, which is perhaps unfair, considering that flick was Murray, Aykroyd, Ramis, and Reitman in their prime. That's really like, one of the greatest comedy teams ever. Murray alone is one of the most charismatic actors ever, and his sardonic wit is irreplaceable by any other human being alive. It was never going to match the original, but I'd be hard-pressed to find another film that comes as close as this one did, especially in its balance of terror and comedy. An interesting review of a film that didn't deserve the firestorm it raged up. Most of the reviews I've seen from folks I trust have said that same thing - middle of the road movie with some funny moments and some sweet production design. I guess what bugs me is that this could have been so much more if they hadn't tried to have it both ways. Either remake the movie, or sequel it. But his half assed reboot doesn't seem to make anyone happy when it comes to the plot. We are constantly reminded of the original and comparing it. A sequel would have done the same, but if it was in the same universe, I think it might have freed up some of the story telling opportunities they could have milked for comedy and horror. Oh well. I'll probably catch this at some point, but I'm not in any rush.